Strong demand for the Panamera sedan is helping Porsche recover. Despite the naysayers and its launch in a recessionary market, Porsche's first four-door sedan has beat company sales targets 11 months after its launch. 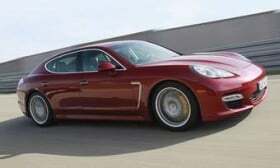 Porsche sold 22,500 Panamera models during the first 11 months the sedan has been on the market. That's 2,000 units higher than Porsche planned, said Bernhard Maier, executive vice president for sales and marketing. The U.S. is Panamera's biggest market, with 7,000 units sold since last October. Detlev von Platen, CEO of Porsche Cars North America, says the rate of sales will increase in the fourth quarter because a higher-volume, V-6 version went on sale this summer. Von Platen is also optimistic about the Panamera's future because 80 percent of the buyers have been conquests from other brands. “It has helped us attract buyers outside of our core segment,” he said. The Panamera has already captured 15 percent of the premium sedan segment that includes the Mercedes-Benz S class, BMW 7 series and Audi A8, he said. Because of the Panamera and the redesigned Cayenne SUV – which also went on sale this summer – Porsche's U.S. sales are 23 percent ahead of last year and on track to stay at that level or increase for the entire year, said von Platen. A hybrid version of the Cayenne goes on sale in November and is expected to account for 10-15 percent of the SUV's sales mix, he said. Porsche is studying additional models, including a smaller SUV that may be called the Cajun. The new vehicle was announced last week by VW Group CEO Martin Winterkorn. Volkswagen AG is taking over Porsche Automobil Holding SE's carmaking operations as the companies build on a partnership that includes sharing vehicle platforms. Winterkorn has said he wants Porsche to expand its four-model lineup in the medium term and double global sales to 150,000 vehicles. Media reports have said Porsche could launch the small SUV at the end of 2014 or early 2015. Maier said he could not comment on a sale date for the Cajun because a business plan has not yet been approved.